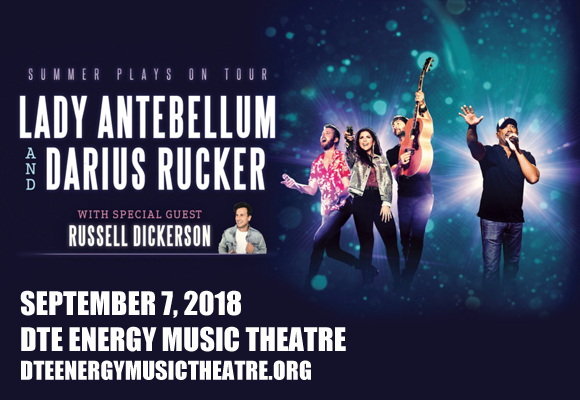 They teamed up for the 2013 smash hit single Wagon Wheel and now, for the first time ever, Lady Antebellum and Darius Rucker are hitting the road together on the Summer Plays On Tour, coming to DTE Energy Music Theatre on Friday 7th September 2018! These Grammy Award-winning country acts will be joined for their co-headlining show by special guest Russel Dickerson, who will play in support! American country music trio Lady Antebellum first made waves in the country music scene when they appeared on Jim Brickman's single "Never Alone" in 2007. They signed with Capitol Nashville later that year and debuted at number one on the Billboard Top Country Albums chart with their 2008 eponymous debut album, making them the first band to achieve this. The group's first three albums have been certified platinum or higher by the RIAA and as of August 2013, they had sold more than 12.5 million digital singles and 10 million albums in the United States. To date, they have charted sixteen singles on the Hot Country Songs and Country Airplay charts, including nine number ones. Lady Antebellum's latest album, Heartbreak, was released in 2017.